If you are a hermit, a recluse or anti-social, then why bother to order a Friends & Lovers report? It would probably be a waste of time and money. If you are currently in a relationship—order a Friends & Lovers report. If you are considering becoming more involved (is he or she THE right one? )—order a Friends & Lovers report. 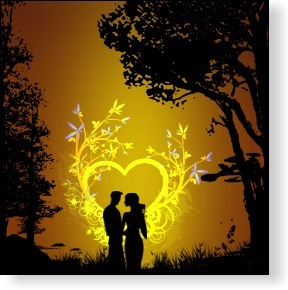 If you would like to learn how to make any personal relationship—whether romantic, with family members, with friends, or even with business associates (and yes, even with the boss)—better, more rewarding and fulfilling—order a Friends & Lovers report. This is a Synastry report. If you are not familiar with the term “synastry,” it is one of the foundation techniques of astrology, having been used for centuries. The accuracy of this technique, mainly operative in compatibility astrology, is one of the main reasons astrology has been so popular for thousands of years. The report we create for you here examines you “in relationship.” It will look at your birth chart, along with the chart of another person, and compare them. It will give you real insight into how exactly you relate (or will relate) to that specific other person. You will then be able to note your strengths and weakness, your unique challenges, and what roles you will likely play in relation to that person. It then turns around and provides similar information from the other person's perspective. If you are looking at the information concerning a current relationship, don’t worry that you will hurt your neck by nodding in agreement, for it is not likely that you will agree with everything you read; however, once you have taken the time to reflect on it, you will often appreciate the insights you have gained. I warn you in advance that these reports are accurate and insightful; therefore, you may not always like what you read or—you may be pleasantly surprised! Whatever the outcome, the knowledge you gain in reading this report can help you to make the most of your relationship, or help you to steer clear of a dead-end relationship—perhaps before you become too involved.